TORONTO, ON (November 4, 2011) – Planning for next year’s 2012 Canadian Superbike Championship is well underway, according to series organizers Frontline CSBK. Central sponsors including BMW Motorrad Canada, Deeley Harley-Davidson® Canada, Honda Canada and Mopar have confirmed their intention to continue supporting the National Series; a season schedule is currently under development and will be announced at the Toronto Motorcycle show opening on December 9th. Pro Superbike will remain the feature class in the National series, with the newly developed Amateur version of Superbike returning for a second straight year of 1000cc action. 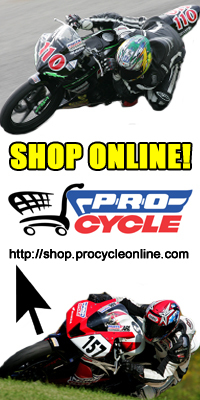 Pro and Amateur Sport Bike will continue to cater to the middleweight production class racers. Last year, the Harley-Davidson XR1200 series made a strong debut on the CSBK tour. That class for the popular flat-track styled street-based “spec” machines will continue unchanged in 2012. The “XR class” is also a hit in the U.K. as well as the U.S.A., and plans call for some co-operative efforts involving American competitors next year. Canadian racers attended an XR1200 class event in support of MotoGP in Indianapolis, IN at the famed Speedway last August. Honda Canada will run a new “spec”, street-bike based class in 2012, building on the four year success of the Honda CBR125R Challenge series. The CBR250R street bike will be the platform for the revamped Honda CBR Challenge class, with young racers riding near stock machines in a display of riding, rather than tuning ability. The current CBR125R Challenge champion, 14 year old Stacey Nesbitt from Quebec, is expected to run the number one plate in next seasons CBR Challenge series. 2012 will mark the seventh season of Pirelli tire support on the national tour, with the famed Italian brand supplying a variety of rubber for all the Canadian racing categories. Pirelli also provides tires for the World Superbike series classes, as well as supporting a range of other National series, including the premier British SBK tour. Posted on November 4, 2011, in CSBK - Canadian Superbike Series. Bookmark the permalink. Leave a comment.